At about 6:30 P.M. on February 28th  Charles Grafton and John Reark noticed a small boy watching a faint column of smoke rising from the basement of the Gass Shoe Co. store. Grafton ran over to the nearest alarm box and turned in the alarm. The fire department responded immediately and began to fight the blaze. Because there was no rear entrance to the basement, the fire had to be fought solely from the Market street side. As a result of this, the fire was pushed throughout the entire basement of the Thompson Building. There were no partitions in this basement, except for a makeshift wall of empty packing crates. . . When the fire reached the second floor of the Thompson Building it jumped to the Porter Building next door. Soon the upper floors of both buildings were ablaze. The windows soon burst from the heat, and the flames were swept by the strong wind into adjoining buildings. 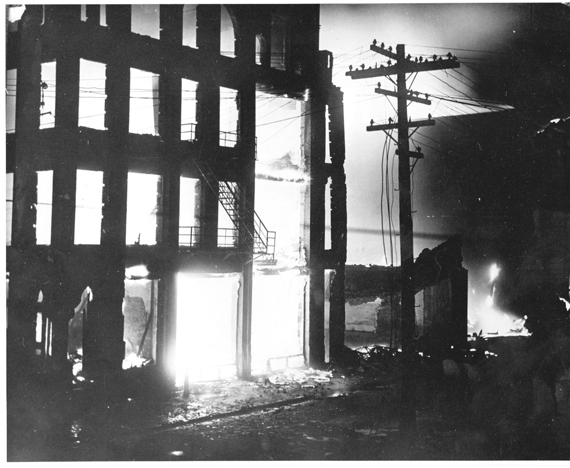 Now the buildings on Fifth street, next to the Thompson Building, began to burn. 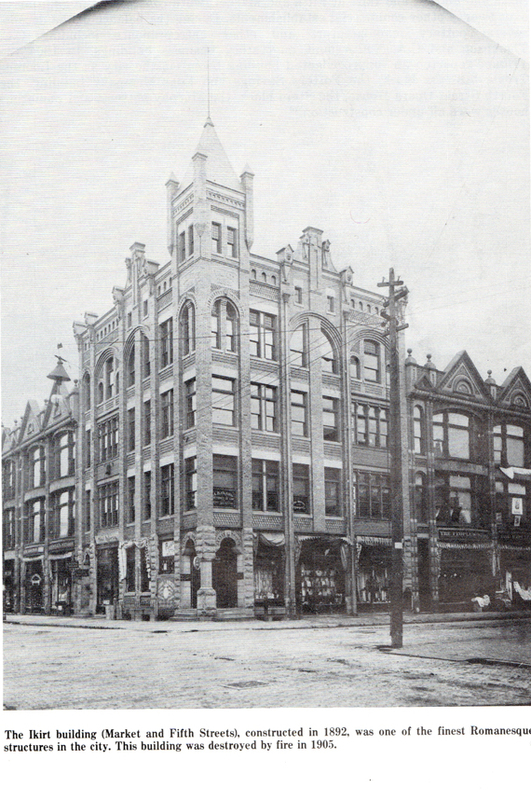 First the Wazbutzky Building and the residence of Theodore Burk located behind it were ablaze, followed by the Milligan Hardware Co. Building. . . . When it was determined that the local department could not handle the huge blaze, Mayor William Weaver called on neighboring communities for help. The men from Chester, W. Virginia and Wellsville, Ohio were the first to arrive. . . .
Men and equipment from Steubenville, Ohio and Rochester, Pennsylvania arrived on special trains sent by the Cleveland & Pittsburgh Railroad. . . . Meanwhile, the flames had jumped Diamond Alley and soon the Smith Fowler Building was a raging inferno. Several other buildings along Diamond Alley received damage from fire and heat, or from falling walls. . . The last building to burn was the Ikert Building at the corner of E. Fifth and Market. Because of the wind direction this building had been spared from the flames until now. The winds changed at about 2 A.M. and the flames began to eat their way through the structure. 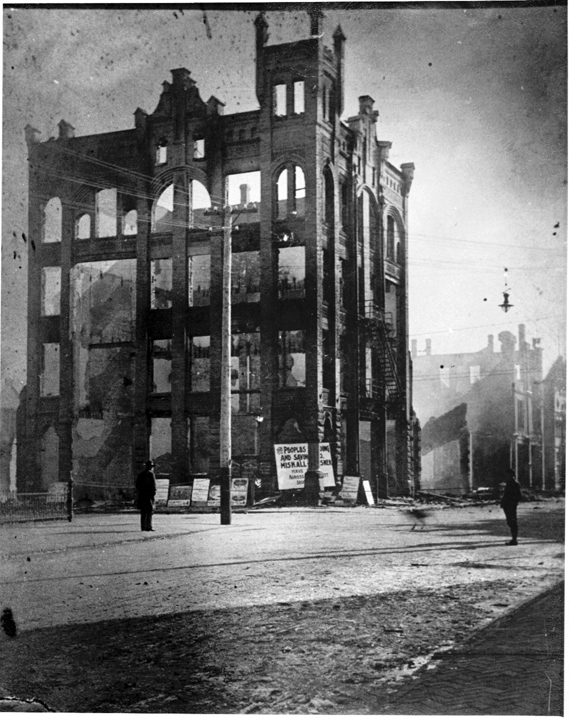 By morning only a blackened shell remained of the four story structure. When daylight came the area was devastated. 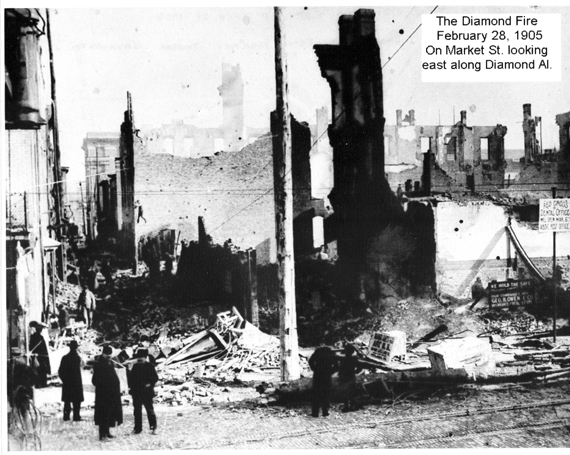 The area surrounded by Fifth Street, Market Street, Diamond Alley and Crook Alley was totally destroyed. The buildings along the north side of Diamond Alley were not in much better shape. Some had been damaged by the fire or falling debris, while others suffered from smoke and water damage.. . .
. . . 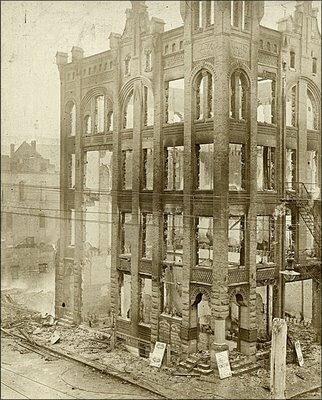 This fire, which resulted in losses exceeding a half million dollars, destroyed six of the city's finest commercial structures including the Ikirt, Thompson, and Milligan buildings. At the time it was the most devastating fire, excluding pottery fires, in the community's history. Twenty businesses and many organizations and professional men were left without offices and stores. [Source: The City of Hills and Kilns: Life and Work in East Liverpool, Ohio, William C. Gates. p. 217.